Do “missing white voters” offer hope for the Republican Party in future presidential elections? Sean Trende, a popular elections analyst for RealClearPolitics.com, thinks so. According to Trende, a large number of white voters dropped out of the electorate in 2012 because they weren’t enthusiastic about Mitt Romney’s candidacy. Trende has argued that getting these missing voters back to the polls could allow the GOP to overcome any advantage Democrats may gain from the growing nonwhite share of the electorate in the 2016 presidential election and beyond. Although Trende claims that he is not advocating “doubling down on white voters,” it is clear that his argument nicely complements the views of conservatives opposed to immigration reform and other policies designed to attract more nonwhite voters to the GOP. If you don’t think you can win a larger share of the nonwhite vote, then the only way you can win is by attracting more white voters to the polls and/or by winning a larger share of the white vote. We have argued that the “missing white voters” theory is unrealistic for several reasons. The most important is that it ignores the missing nonwhite voters — data on voter turnout in 2012 show that a substantial number of nonwhites also dropped out of the electorate in 2012. This past election featured a lower turnout overall than 2008, and this was true for nonwhites as well as for whites. A future presidential election that produced a higher turnout of white voters would almost certainly also produce a higher turnout of nonwhite voters. Thus far the debate about “missing voters” has been based largely on exit poll and U.S. Census Bureau estimates of the size and turnout rates of different racial groups in 2008 and 2012. However, the exit poll by definition has no information on these missing voters. And the census surveys, while they do cover nonvoters, include no questions on the political attitudes of either voters or nonvoters. Thus, neither data source allows us to compare the characteristics and attitudes of three key groups: returning voters, dropouts and new voters. Fortunately, there is another data set that does include questions on the political attitudes of voters and nonvoters alike, and that does allow us to compare the characteristics and attitudes of returning voters, dropouts and new voters — the 2012 American National Election Study. The ANES is the longest-running and most widely respected academic survey of the American electorate. It has been conducted in every presidential election year and most midterm election years since 1948. The 2012 survey is notable for its addition of an Internet-based component and for its very large sample size. Almost 5,500 eligible voters were surveyed before and after the election, and the overall results matched the outcome of the presidential election reasonably closely, with Barack Obama winning 52% of the vote to 45% for Mitt Romney. * (In the actual election, Obama won 51% to Romney’s 47%). The most important feature of Table 1 in relation to the debate over “missing voters” is that the dropouts were significantly less white than the returning voters. This is consistent with our earlier critique of Trende’s “missing white voters” theory. The reason that the white share of the electorate decreased in 2012 was not that whites made up a disproportionate share of dropouts (even the census data, which are most favorable to Trende’s case, indicate that less than a fifth of the white share decrease can be accounted for by disproportionate white dropouts; the exit polls and the ANES data presented here indicate far less). The white share of the electorate decreased because the new voters included an even larger proportion of nonwhites than the dropouts and a substantially larger proportion of nonwhites than the returning voters. Of course, the impact of dropouts and new voters on the outcome of an election ultimately depends on the candidate preferences of these two groups compared with the candidate preferences of returning voters. Here, the results from the 2012 ANES are even more damaging to the “missing white voters” theory, as the data displayed in Table 2 show. The data in this table show that, based on their pre-election candidate preferences, dropouts favored Barack Obama over Mitt Romney by a somewhat larger margin than returning voters.^ In other words, the “missing voters” in 2012 were more Democratic than the returning voters. However, new voters favored Obama by a considerably larger margin than either of these groups. So the net impact of turnover in the electorate was to produce a 2012 electorate that was more inclined to vote for Obama than the 2008 electorate. While the 2012 dropouts were not, as Trende’s argument implies, disproportionately white, the “missing white voters” theory could still be saved if it were somehow possible to bring white dropouts back to the polls at a much higher rate than nonwhite dropouts. White dropouts in 2012 did prefer Mitt Romney to Barack Obama, although by a slightly smaller margin than returning white voters. In the pre-election survey, Romney led Obama by 53% to 41% in this group. In contrast, returning white voters favored Romney by a margin of 55% to 40%. So bringing these white dropouts back to the polls probably would not increase the GOP margin among white voters but it could increase the GOP margin in the overall electorate if they turned out at a much higher rate than nonwhite dropouts. But how realistic is the expectation that white dropouts could be turned out at a much higher rate than nonwhite dropouts in 2016? 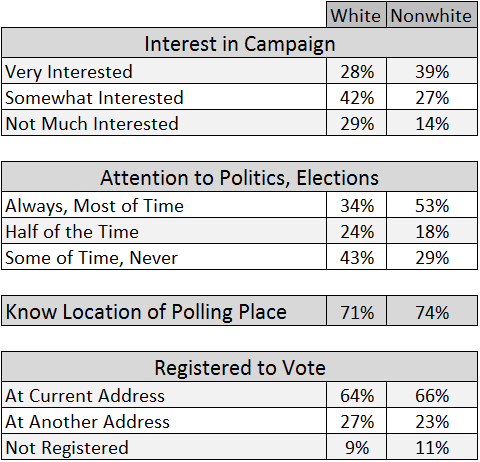 In order to answer this question, Table 3 compares white and nonwhite dropouts on several indicators of political engagement — interest in the 2012 presidential campaign, general level of attention to politics and elections, awareness of the location of one’s polling place and, last but not least, registration status. On every one of these indicators, nonwhite dropouts do as well as or better than white dropouts. Nonwhite dropouts expressed a higher level of interest in the 2012 presidential campaign than white dropouts and a considerably higher level of attention to politics and elections in general. And nonwhite dropouts were just as likely to know the location of their polling place and just as likely to be registered to vote at their current address.^^ Based on these results, the expectation that white dropouts could be turned out at a substantially higher rate than nonwhite dropouts in 2016 appears to be very unrealistic. Beyond the fact that the 2012 dropouts do not look like a group that Republicans can count on for help in future elections, a focus on “missing voters” completely ignores what is almost certain to remain the most important source of change in the racial composition and political orientations of the American electorate for the foreseeable future — generational replacement. To demonstrate the potential impact of generational replacement on the electorate, Table 4 compares the racial composition, party identification and presidential candidate preference of different age groups in the 2012 ANES survey based on respondents who reported voting in either 2012 or 2008. So the 2012 dropouts are included in this table. The age-group differences in race, party identification and presidential candidate preference in Table 4 are stunning and underscore the direct threat posed by generational replacement to the future viability of the Republican Party. The youngest age group in the electorate was the most racially diverse, the most Democratic and the most likely to prefer Barack Obama to Mitt Romney. In contrast, the oldest age group in the electorate was the least racially diverse, the most Republican and the most likely to prefer Mitt Romney to Barack Obama. Moreover, based on the known racial characteristics of those who will be entering the electorate over the next several decades, it is almost certain that this trend will continue. While we cannot predict with certainty exactly what the racial composition of the electorate will be in any given election, we can predict with a high degree of confidence that the nonwhite share of the electorate will continue to grow for many years to come. Given the near inevitability of this demographic trend, a political party that depends almost entirely on the support of white voters will face a more and more difficult task in assembling a winning electoral coalition. Focusing on “missing white voters” ignores this fundamental and irreversible trend. *Detailed information on the 2012 ANES including sampling procedures, questionnaire design and question wording can be found at www.electionstudies.org. **The fact that the number of new voters is larger than the number of dropouts might appear to contradict the fact that the total number of voters actually decreased between 2008 and 2012. However, this apparent discrepancy is probably due to the fact that there is an additional set of dropouts who cannot be surveyed — those who died between 2008 and 2012. Approximately 10 million Americans would have died over this four-year period and the vast majority would have been eligible voters. ^Pre-election interviews were conducted in September and October. Candidate preferences in the pre-election interview almost perfectly predicted voters’ candidate choices — 98% of voters cast their ballots for the candidate that they preferred in the pre-election interview. ^^The large proportions of white and nonwhite dropouts who reported being registered at another address suggests that one of the major reasons for voters dropping out of the electorate between elections is geographic mobility and the necessity of re-registering at a new address after moving. Alan I. Abramowitz is the Alben W. Barkley Professor of Political Science at Emory University and author, most recently, of The Polarized Public? Why American Government is So Dysfunctional. Ruy Teixeira is a Senior Fellow at both the Century Foundation and the Center for American Progress and is the author or co-author of several books, including The Emerging Democratic Majority (with John B. Judis).